While many people have the luxury of having weeks and even months to plan and pack for their move, others have to deal with a more restrictive move out schedule. For example, people who have lost a job, separated from a partner, downsized due to high costs for the place where they live, etc. may have only days to plan their move. At Russell’s Moving and Storage we do everything we can to accommodate people who are on this kind of schedule. We understand that life happens and that sometimes we must go with the tide. To avoid critical mistakes and reduce the enormous stress involved with frenzied moving preparations, we offer you the following tips for managing your emergency move. Get quotes: Call us immediately if you are under strict time constraints. Don’t assume that we will not be able to find a solution to your move out dilemma. We pride ourselves in being able to work with our customers’ schedules. 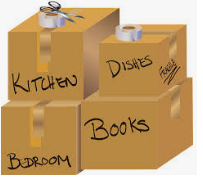 Make a list of needed packing materials: Make a checklist of things you will need such as boxes, tape, box cutters, tie-down straps, stretch wrap, furniture pad, etc. Start your search for these supplies as quickly as possible. The key to a rapid move is organization. Dispose of items that you no longer want: Moving around items that you no longer need or use will only cost you precious time. Donate, sell or throw away items that you do not want. Alternatively, our full service moving Los Angeles company also has a safe, air-conditioned facility to store the items you may need later on. Recruit help from friends: Many hands make light work as the saying goes. Friends and family can help speed up the process of moving considerably. Don’t be afraid to explain why you need to move quickly and why their help is so necessary and appreciated. Label boxes smartly: This goes toward the general idea of remaining organized throughout the entire move. Items are easier to pack and unpack when they are clearly labeled. In short, emergency moving is a challenge that can be successfully overcome if you keep your cool and take advantage of our efficient tips for moving on short notice. Call our Los Angeles moving and storage company if you are facing such an emergency. We will try to work with your schedule.